Want to make your sweep picking faster and cleaner in the next few minutes? There is one element of sweep picking most guitarists struggle with that you can master very quickly. That element is finger rolling. It is a technique for playing notes on adjacent strings, on the same frets, with the same finger. Notice how you have to play 3 notes on the 14th fret on strings 4 3 and 2. This can be tricky to play cleanly if you barre your middle finger across all 3 strings like many guitar palyers do. There is a better (and easier) way to do it. Understanding the biomechanics involved in this technique, so you can practice it correctly. This makes your guitar practice more effective and efficient. Becoming aware of common guitar practice mistakes that make finger rolling hard to master (and learning how to avoid them). Paying attention to the right things when you practice, so that sweep picking fast and clean becomes very easy. Clean and fast finger rolling also requires you to improve your ear's ability to hear sloppy mistakes at very high speeds. Most guitar players struggle to identify specific notes in their playing that are not clean when they play fast. (This is true with all techniques, not just sweep picking.) 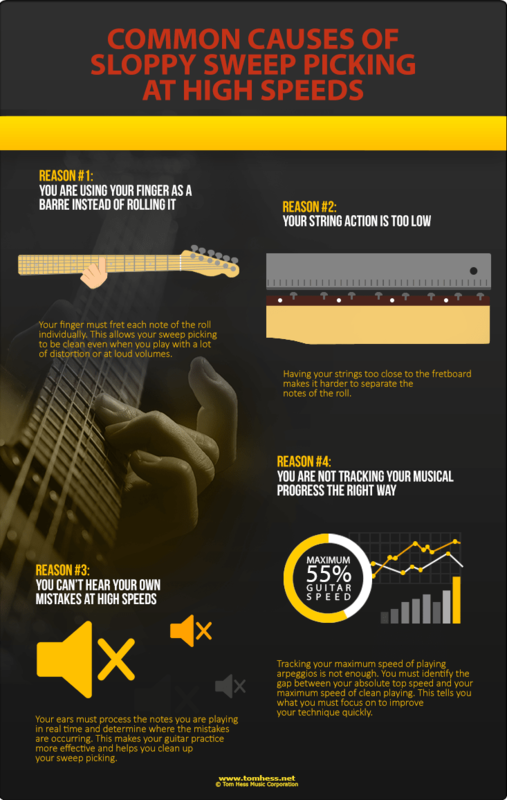 Mastering finger rolling develops your ears' mental processing ability that carries over to ALL techniques you play and practice on guitar. Your finger must fret each note of the roll one at a time. This allows your sweep picking to be clean even when you play with a lot of distortion or at loud volumes. Fretting several strings with one finger (using a barre) causes notes to bleed together and creates a sloppy mess. Watch the video (starting at 2:20) to hear how this mistake makes your guitar playing sound bad. Step 1: Isolate the rolling motion and practice collapsing (and uncollapsing) the knuckle of each finger. Step 2: Train the roll in the context of actual arpeggios as soon after you learn to do it in isolation. Endless isolation practice creates a gap between your ability to do the technique and your ability to integrate it into your guitar playing. Continue training the roll in isolation, but gradually increase the amount of time you practice the motion in context. Learn how to develop your guitar technique and build speed. Learn other sweep picking practice tips that help you master this technique and use it in your guitar playing. String action (how high your strings are away from the fretboard) determines how easy it is to keep your finger rolling clean. Having your strings too close to the fretboard (low action) makes it harder to separate the notes of the roll. As you collapse the knuckle, the previous note you played often continues to ring. Solution: Raise your string action slightly. This helps you to release each note of the roll when you are done playing it and only have one note ringing at a time. Your ears must process the notes you are playing in real time and determine where the mistakes are occurring. This makes your guitar practice more effective and helps you clean up your sweep picking. Identifying your own mistakes at fast speeds. Merely detecting sloppy playing is not enough. You must know which specific notes are sloppy without having to slow down. This enables you to fix your mistakes quickly. Training your ear to hear music at fast speeds. You can train this skill the same way you train your hands to play fast. One approach is to enter any arpeggio into a tab editor program and play it back for yourself at very high speeds. Set the playback to loop over and over. Listen to the notes in headphones and focus on one note at a time. This skill is key to cleaning up your guitar playing at faster speeds (no matter if you are sweep picking, playing scale sequences, 2-hand tapping licks, legato licks, or anything else). Periodically rotate which note you listen to. Rotate to another note when you have confirmed that the previous note you were focusing on is perfectly clean and articulate. Begin this exercise at 100% of your current top speed and work up to 125-150% of your top speed. This drill helps your ears and brain to keep up with your hands when you play guitar. How fast they can play something cleanly (without excess string noise or notes bleeding together), consistently, accurately and with both hands in perfect sync. The gap between these elements of your guitar technique and your absolute maximum speed. Your guitar playing speed means little if your playing is sloppy. To master fretting hand rolling, find your top speed of sweep picking cleanly and get that speed near your maximum. This free sweep picking eGuide helps you implement the tips in this article and master sweep picking easily. Learn how to master the guitar with the most proven online guitar teacher.